The new album builds on the strengths of the first, but with a much more muscular sound. Howlin’ Mojo Bones are passionate about what they do and Voodoo She Do ably demonstrates they can deliver that passion in spades. 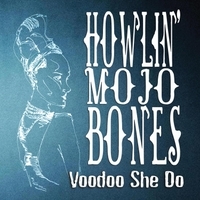 Recorded over the summer of 2018 at Woodshed Studios in North-East London, Howlin’ Mojo Bones have produced 12 new, original songs, showcasing their own distinctive sound, led by the charismatic voice of Howlin’ George Witter ably partnered by guitarist Steve Crane and supported (make that driven) by the excellent rhythm section of Gus Denton’s bass and John Baker’s drums. The UK’s premier Blues magazine, Blues Matters described Howlin’ Mojo Bones as a band with “blues running right through them”, Voodoo She Do shows the blues is alive and well and flourishing in the Enfield Delta!